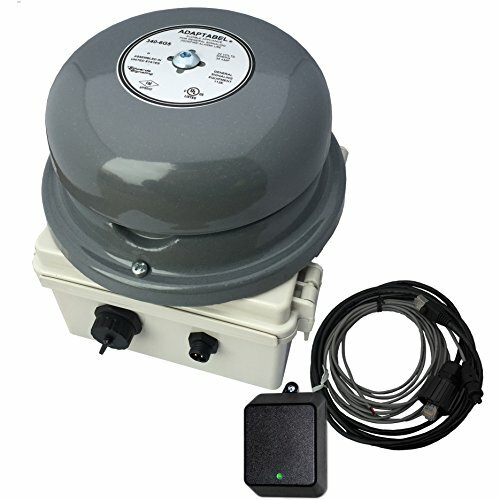 The Netbell-KL is a compact, self-contained and high volume web-based break bell system for factories who are looking for a fully automated web-based timed alert system for signaling shift changes, general alarm, and breaks in areas of high ambient noise levels. This bell kit is loud enough to be heard over equipment and won't have the same sound like some industrial equipment or a fire alarm. The system is built on a TCP/IP platform with a built in web server, which allows users to access, control, and schedule the bell accurately and effectively using an internet connection from anywhere. The NetbellTM-KL features a high quality 6 inch high output bell (102dBa@1m and 92dBa @10', 90dBa@30' from our in-house testing) and a completely wired web controller installed within a NEMA-rated box; all software and mounting hardware required for installation is included. With the easy-to-use bell schedule software, users can easily add event schedules with different ringing duration for different event or import/export their existing data using a simple text format. It's ready to go out of the box, and you need only connect the unit to power and the existing network with the provided cables; it can be connected anywhere on the network, and does not require a direct connection to a PC. Scheduling and setup is accessed through any standard web browser. For anyone who has separate areas or multiple buildings where running additional wiring is not an option, but the locations are connected by a network, then we have a solution using the remote feature built into our products. We call it "Networked Bell System". With our Netbell product and our Koda web controller you can setup a system over a network to ring multiple bells or horns on multiple locations. The Netbell would work as your master control board for scheduling, and then with the remote function built in you can also control additional bells with Koda web controller remotely.